The primary goal of this COBRE center is to increase the number of NIH-supported biomedical researchers in the state of South Carolina, particularly at Clemson University. 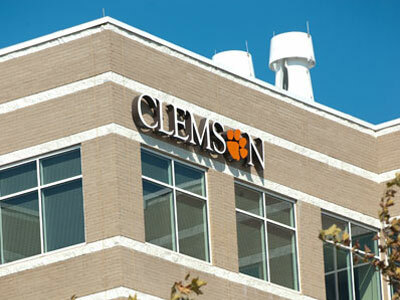 For this purpose,Clemson University's unique strengths in biomaterials and tissue engineering are complemented by expertise in medicine and developmental biology at the Medical University of South Carolina and the University of South Carolina to establish a Bioengineering Center for Regeneration and Formation of Tissues (SC BioCRAFT) at Clemson University. This COBRE center will significantly augment collaborative efforts in South Carolina to recruit, train,and retain a critical mass of investigators with cross-disciplinary skills to collaborate effectively in the research area of regenerative medicine. We strive to find better treatments for human diseases by fostering interdisciplinary collab-orations among researchers and enhancing interdependent intellectual capital and resources within the State of South Carolina. Agneta Simionescu - Her R01 applicaiton was funded as a of September 1, 2018. CELL AND MATRIX INTERACTIONS IN DIABETIC VASCULAR TISSUE ENGINEERING MODEL (R01HL133303). William Richardson - His NIH R01 grant application was scored 14th percentile and it is under NHLBI pay line. Jeffrey Anker - received funding as co-PI on NIH R01 entitled "Focused-x-ray Luminescence at uCT Resolution and uM-level Sensitivity" NIH R01 (2.524 M, PI Chinqang Li; Anker portion $655,418). He also received University Research, Scholarship, and Artistic Achievement Award (USRAAA), 2018. Antonios Kourtidis, Ph.D. - became Teacher of the Year (2018), College of Graduate Studies, Medical University of South Carolina, USA. He was nominated by the Hollings Cancer Center, MUSC for the V Foundation and the Pew-Stewart Scholar Awards for Cancer Research (2018). Jeremy Mercuri - had two proposals funded. North American Spine Society Proposal funded (PI: J. Mercuri; 9/2018 - 9/2019), and Integra Life Sciences Research Proposal funded (PI: J. Mercuri; 9/2018 - 9/2019). SCBioCRAFT is helping junior faculty achieve high accolades. SCBioCRAFT has improved core facilities at Clemson and their free access to the junior faculty. We purchased IVIS Lumina XR equipment and installed it in our animal facility at Godley-Snell Animal Research Center. This instrument is used extensively by COBRE and non-COBRE personnel. Since the initiation of Phase I, Clemson University, as part of its commitment to our COBRE center and the IDEA program, has funded the purchase of three new systems for Clemson's electron microscopy facility. A new variable pressure field emission electron microscope, Hitachi SU6600 VPFESEM, provides high-resolution images. A Deben cooling stage with a temperature range of -25° C to +50° C was purchased for the SU6600; the microscopy facility purchased the Hitachi TM 3000 tabletop scanning electron microscope. Installation of a new dual beam focused ion system, NB5000 FIB, has been completed. The Imaging Core has provided multiple services to 45 faculty and students through our Phase I and II COBRE initiative. In 2013, Dr. Terri Bruce, who served as COBRE core Co-Director, was appointed director of the Clemson Light Imaging Facility, which is available to all COBRE participants. We further purchased a small animal ultrasound system from Visual Sonic, Vevo2100. It has new digital platform that delivers outstanding performance in a wide range of animal models and applications including cardiovascular, cancer and infammation. Many PIs are using this equipment for research that would not otherwise be possible. We also purchased a Vivo-Vasc software program that uses ultrasound data from Vevo2100 and provides all vital statistics for vascular health such as quantifying wall motion using advanced speckle tracking, assessing stiffness using pulse wave velocity, and measuring microanatomy using vessel wall analysis. Six new junior faculty hired. Dr. Jeremy Mercuri and Dr. Ann Foley graduated from the Pilot Projects and are now funded by NIH. Dr. Shibnath Ghatak and Dr. Will Richardson were selected to be part of the Center's Pilot Projects. Dr. Jeff Anker received both NIH R21 and R01 funding for his project. Dr. Anker also was also awarded a cash prize in September 2016 by Spiro Institute for Entrepeneurial Leadership's annual Pitch Smackdown competition. The 2016 Annual Meeting took place February at the CUBEInC campus in Greenville and included six external advisory committee members who came from all over the US.